Learn more about Viera, Brevard County and answer the question: Where is Viera Florida?, and why it's a good idea to Invest in Florida Commercial Land at Auction in this growing Spacecoast Community. “Florida Real Estate will always he a healthy investment, with the population increases of the last decade and the certain increase of new residents in the future Florida land will always be desirable…"
Myers Jackson of United Country Certified Real Estate, in Cooperation with Bobbie Bockman, D. Basile Real Estate, LLC of Melbourne, Florida want to educate investors on Where is Viera Florida and how to Invest in Florida Commercial Land at Auction. 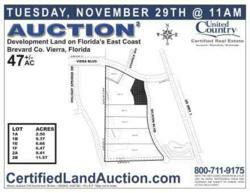 On Tuesday, November 29th at 11am Certified Real Estate will offer 47+/- Acres Brevard County Florida Commercial Land at Auction in Viera Boulevard Commerce Park at Live On-Site Auction. Where is Viera, Florida? It’s located adjacent to Melbourne Florida, in Brevard County, on Florida's Southeast Coast. What may be more important than where is Viera Florida? What is Viera and why buyers should invest in acres for sale in Florida at Auction? Viera is a master planned lifestyle community, with 52 neighborhoods focused on ultimate convenience with active senior communities as well as desired community for new families due to it’s amenities such as the Brevard County Zoo, Shopping, Schools and recreational opportunities. Where is Viera Florida is Why buyers should invest in Central Costal Community located in Brevard County Florida. Viera Boulevard Commerce Park on Viera Blvd, Melbourne, Florida. Real Estate is offered as a whole or divided in 6 Tracts with sizes ranging from 2.5-11+ Acres. Melbourne, FL Properties and located in South Brevard County in the Viera market but without the expensive Community Development District (CDD) taxes. Viera Boulevard is well located and extends from US Highway 1 over I-95 into West Viera. An area of explosive growth; real estate is ideal for wide variety of uses close to retail, and large residential communities. Melbourne Florida Property is zoned for industrial or commercial use. Near all major amenities including schools, shopping, multiple golf courses, the Avenues Mall, a proposed medical complex and distributors. Good location with convenient access to all major roadways. Viera Boulevard Commerce Park, a 104 acre fully developed and platted commerce park has only 47 acres remaining for sale. Viera Boulevard is the entranceway to the New Town of Viera, a 36,000-acre Planned Unit Development adjacent to the Melbourne, Florida property for sale at auction. Third Quarter 2011 Median home prices in Brevard increased 17.7% over 2010 third quarter; supporting a vital commercial and retail community. Visit CertifiedLandAuction.com for company information and visit the Auction Calendar to access Division Plat Maps, and to view additional properties offered in the 2011 Auction Series. For Additional Information contact Myers Jackson, Auctioneer 800-711-9175. Certified Real Estate & Auction AB2845-AU2726-10% Buyers Premium. Bobbie Bockman, Realtor/Broker of D.Basile Real Estate, LLC, 444 S Babock St., Melbourne, Florida 32901, (ph) 321-543-1065. United Country Real Estate is the largest fully integrated network of conventional and auction real estate professionals in the United States. The company has been an innovator in real estate marketing since 1925. United Country supports nearly 600 offices across the U.S., Costa Rica, Panama and resort areas of Mexico, with a unique, comprehensive marketing program that includes one of the largest portfolios of property marketing websites (more than 3,000 separate sites and traffic of approximately 3 million visitors per month), multiple United Country real estate catalogs with national distribution, an extensive buyer database and national advertising of local properties that reaches more than 90 million homes per week. United Country has recently been recognized by AllBusiness.com, The Land Report, Entrepreneur and The Wall Street Journal as one of the top U.S. real estate companies. Invest in Florida Commercial Land at AuctionWhere is Viera Florida?